Disney’s “The Jungle Book” has literally every single element that constitutes a great children’s film: excellent voice acting, beautiful animation and a barbershop quartet of vultures. Almost every bit and piece of this film is perfect, and it is easy to see why its popularity has stayed consistent in the 52 years since it’s been released. Some minor disjointedness with its plot aside, this is one of the best that Disney has had to offer in its entire repertoire of animated films. The film is perhaps most known for being the last one that Walt Disney worked on before his death from cancer in 1966. It is said that he was intimately involved in the process of plot development, his most enduring decision being the addition of the Sherman Brothers to compose the bulk of the movie’s soundtrack. Before even getting to that stage, though, Disney faced a bit of a dilemma with “The Jungle Book.” How could he adapt a series of stories written by Rudyard Kipling in 1894 into an entertaining film for children? The screenplays he were given were dark and foreboding, with the ending arriving on a much more sinister note. How was this film supposed to bring the Disney name back into the animation zeitgeist after the mixed critical reception to “The Sword and the Stone”? His solution was to combine elements from the stories “Mowgli’s Brothers” and “Kaa’s Hunting,” lighten up all of the nasty bits and condense the plot into something easily digestible. The plot was relatively simple, focusing on wise panther Bagheera’s efforts to get the hesitant Mowgli out of Shere Khan’s fur and safely into the Man Village. With some song and dance. Hey, if anyone was grumbling about accuracy then they could wait until 1975 for Chuck Jones’s fantastic “Jungle Book” series of specials. The lighter elements that Disney championed for are the ones that work the most in the film. The Sherman Brothers soundtrack, buoyed by fantastic musical performances by the film’s star cast, is one of the best aspects of “The Jungle Book”. The songs are catchy, and the animation is well-choreographed with visual gags to keep viewers engaged. 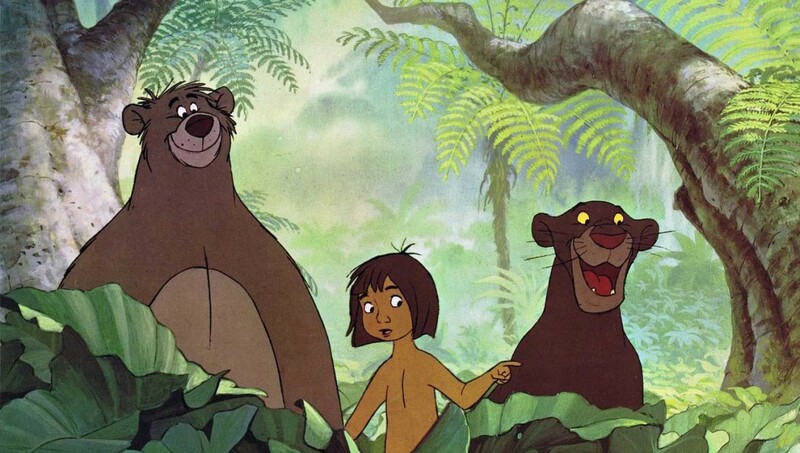 Who today does not know “Bare Necessities” or “I Wanna Be Like You”? These two songs really tie together two huge concepts within the film: Baloo’s lackadaisical nature and the threat that Mowgli faces from opportunistic animals, respectively. The threat to be forced to give an orangutan fire so he can be just like the men in the villages sure does sound better when Louis Prima is singing about it. This film is fortunate to feature the talents of some of the most talented voice actors in the business, such as Phil Harris, Sterling Holloway and George Sanders. Each and every cast member of “The Jungle Book” brings so much life into their character, and it makes for such an enjoyable viewing experience. Sanders and Harris especially bring something special to the table in “The Jungle Book” with their spirited performances of Shere Khan and Baloo, respectively. Harris brings an earnest twang to his Baloo, and one can see why Disney expanded Baloo’s role to quasi-main character after being charmed by Harris’s performance. On the other side of the jungle, Sander’s deep bass voice makes for a truly menacing villain, and it was a disservice to his performance that the situation with Shere Khan was resolved so quickly at the end of the movie. That leads to the main letdown about “The Jungle Book”. The conflicts are solved so quickly that there is hardly any dramatic tension to any of it. Shere Khan gets spooked by one flaming branch and immediately runs away. After an hour of resisting getting sent to the Man Village, Mowgli falls deeply in like with a village girl and wanders after her, totally helpless to his feelings. But the ending of the film is not what is important. It is everything leading up to that – the songs, the jokes and the journey – that truly sticks with audiences the world over.